Is the Wood Paneling Trend the Unsung Hero of the Design World? We often think of wood paneling as the stuff that covered our grandparents’ basement walls in the ’70s, ’80s, and ’90s. Just picture wood-paneled walls mixed with shaggy carpeting, floral sofas, and foam ceiling tiles—not quite your idea of trendy decor, right? But a few recent designers have hinted at the fact that wood paneling might be making a comeback. A couple of years ago, New York’s Flower Shop—a trendy Chinatown bar—was one of the first to bring back the “grandma’s basement” look with orange carpeting, kitschy posters, yellow vinyl banquettes, and—yes—wood paneling. But there is more to the increasingly popular wall covering than simply falling back into a scarily retro void of ’90s memorabilia. Instead, wood paneling is coming back in chic and modern ways, like on the walls and ceilings of a chic new Paris hotel, in a trendy Japanese-inspired London flat, and even in a Swiss chalet–style California home. Want to try the trend for yourself? Here are some of our favorite recent iterations of wood-paneled walls. In Paris’s new Brach Hotel, guest rooms were entirely paneled from floor to ceiling. Philippe Starck, the designer, used this clever wallcovering to seamlessly blend built-in shelves—featuring art, African masks, and other objets d’art—into the decor, creating a rich yet intimate space that makes the most of the small square footage. In this stunning Shoreditch apartment, a limed oak-brush timber lines almost every wall and cabinet, creating a textured quality that’s lost on plain white walls. The architects, Chan and Eayrs, wanted to create a relaxing space that evoked the outdoors, so shades of green and light wood tones create the desired ambiance. In this colorful West Village apartment, the team at Studio Shamshiri used light oak wood paneling to frame a sleeping nook that also houses a bookcase and wall lights—creating the perfect reading nook. Here, the neutral wood tone balances out the vibrant blues, purples, and yellows that cover every other surface from the rugs to the curtains and even the walls. In Savio Volpe, a modern Italian Vancouver restaurant, design firm Ste. Marie used pleated oak walls to create a rhythmic backdrop to the space’s vibrant energy. This modern take on classic wood-paneled walls is modern, streamlined, and allows sconces and artwork to shine. We could see this wall covering doing equally well in a residential setting. Pamela Shamshiri loves to play with wood-paneled walls in many of her designs. But few projects have adopted them quite as liberally as this California home. 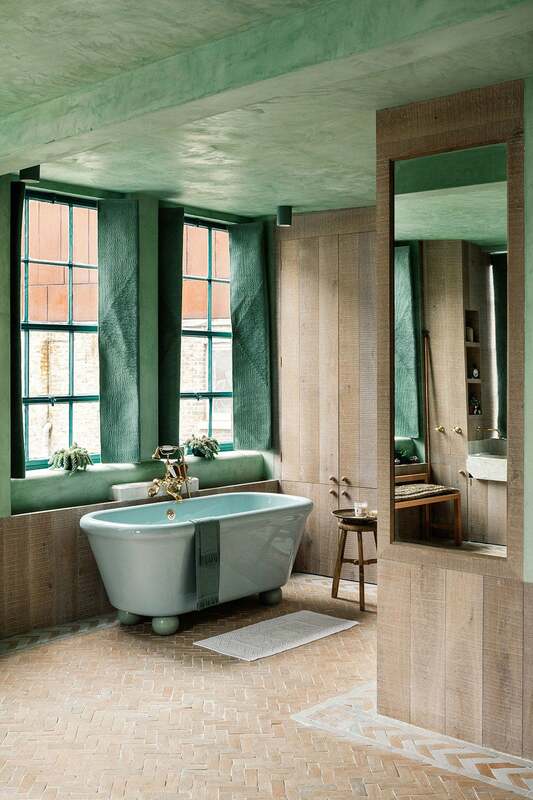 Her design firm, Studio Shamshiri, was tasked with restoring a 1906 Swiss chalet–style home in which she kept most of the wood accents intact while painting a few of the walls in shades of soft pink, green, and burgundy. The result is a wonderfully updated take on a classic country home.